The certificate for the given thumbprint could not be loaded from the Current User/Personal certificate store. Please install the certificate. While I was able to resolve the error, I cannot reproduce it (and gave up trying), but if you face the same problem, hopefully this will help you. 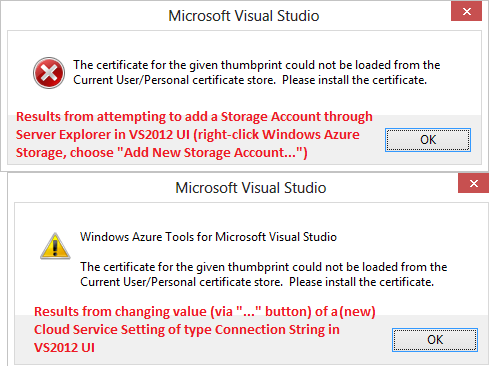 If Visual Studio was looking for a certificate, where was it looking? It turns out that the Windows Azure Tools for Visual Studio store some certificate related references in a file called Windows Azure Connections.xml in your personal settings area on Windows. This file is created on your behalf once you’ve created any Publish Profiles by Publishing Cloud Services to Windows Azure from Visual Studio. Note that the NamedCredential XML element item may be repeated. The problem turns out to be that one of the certificates referenced (identified by thumbprint via CertificateThumbprint XML element) either it is not installed properly locally, or not installed in the associated Windows Azure Subscription (identified by SubscriptionId XML element). Make sure the certificate has been uploaded to the Windows Azure Portal for the SubscriptionId referenced within Windows Azure Connections.xml. That’s it. Should work. 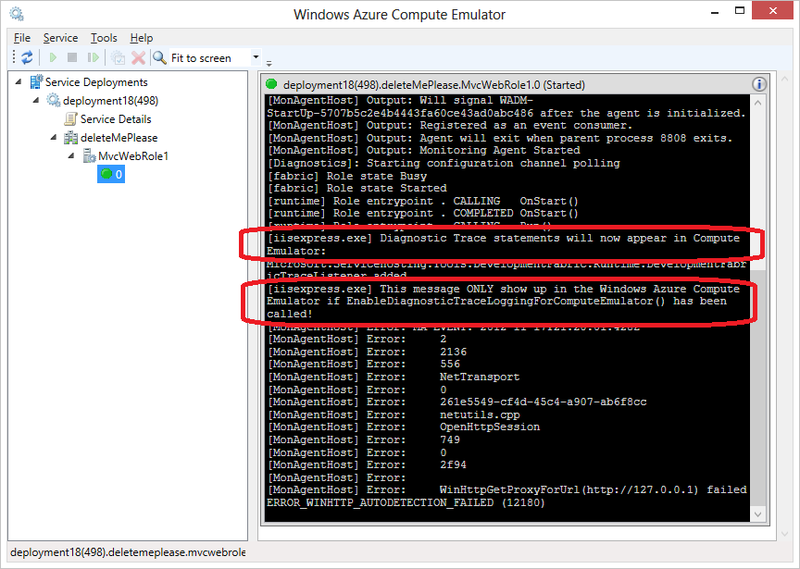 Worst case you can delete each element of your Windows Azure Connections.xml profile and start over. These are the two specific scenarios where I saw the problem in case you are interested. This scenario failed whether or not a project was open. This message is extra confusing since I don’t think there ought to be any certificates involved here. And no project/solution is open. This scenario requires an open Azure project. Open the UI tool for editing Azure configuration by opening your Cloud Project in Solution Explorer, drilling into Roles, and double-clicking on a Web Role or Worker Role project. The Role configuration editor window opens in Visual Studio. Here are the screen shots for the two error dialogs (slightly different). This entry was posted in Azure, Cloud Computing, Crypto and tagged troubleshooting on November 29, 2012 by Bill Wilder. Pretty simple generic C# code to iterate through all certificates in the Windows Certificate Store and dump some metadata about each to standard output. Note that it really gets ALL certificates and doesn’t hard-code any stores or locations. This entry was posted in Azure, Cloud Computing, Crypto, Programming on November 2, 2012 by Bill Wilder.